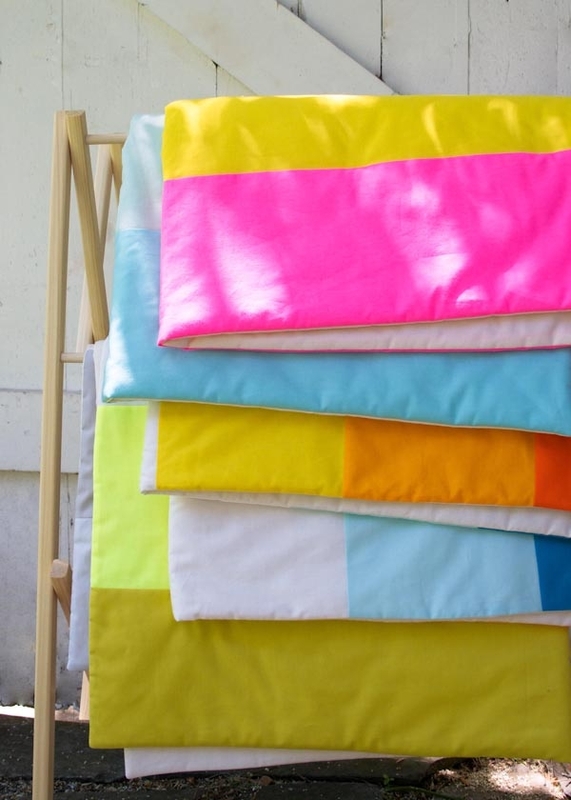 Looking for a quick sewing project that packs a colorful punch? 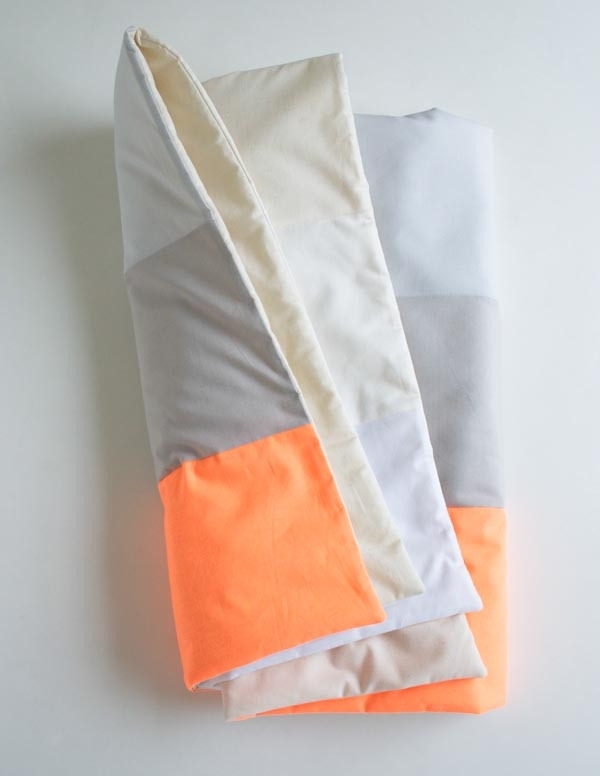 Our new Super Easy Sewn Blanket for Beginners is it! Based on our always-popular knitted Super Easy Blanket, this sewn version captures the same modern elegance in six simple stripes. P.S. To view all of our Super Easy Blankets, just click here! 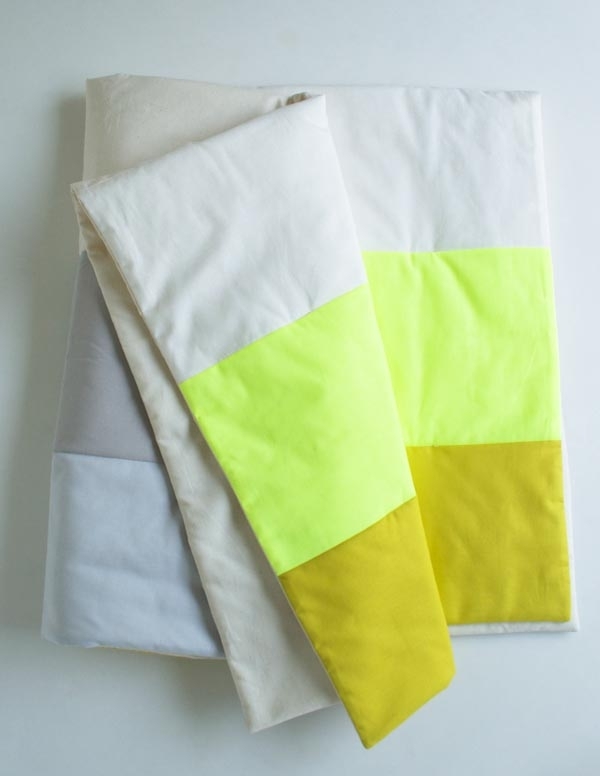 To make one Super Easy Sewn Blanket for Beginners you’ll need …. A 110-yard spool of Gutermann’s Cotton Sewing Thread. We used color 1040. We also recommend the following tools for precise cuts and easy seams . . . The Super Easy Sewn Blanket for Beginners Pattern is available for purchase as either a hard copy or download. 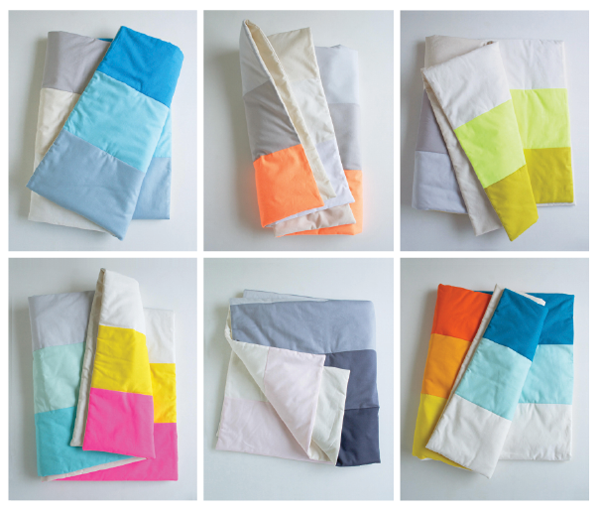 TAGS: Blankets, Colorblock, Neon, Piecing + Patchwork, Purl Soho Kits, Purl Soho Patterns, Super Easy Blankets! 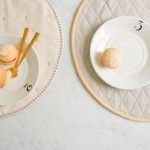 Welcome to the New Purl Bee! Will you have the instructions available separately, either free on the site or for purchase? I would love to make this but would like to use a different color scheme. Thanks for getting in touch about this. Currently the pattern is only available as part of the kit but we might make it available on its own in the future, so it’s nice to hear from you that you’d be interested. Same here as well. Would most definitely be interested in the pattern to make using my own fabric. Thanks! Can I buy a second kit without the pattern… Fabric only? 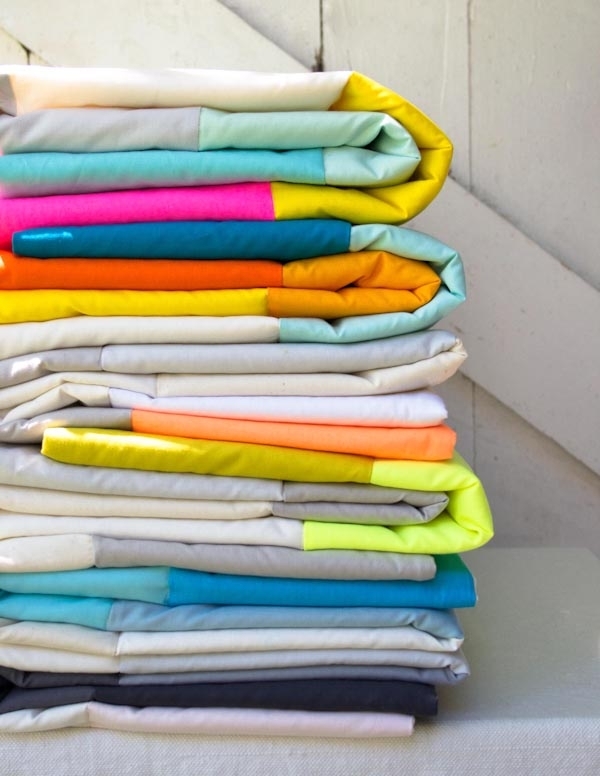 We would be happy to put together the fabrics for you separately. Please email customerservice AT purlsoho DOT com and they can get it together for you. Usually projects on Purl Bee come with the instructions and then this was often supplemented by the kit purchase, if desired. With this project, it seems it is only available if we purchase the kit. So it’s really not a Purl Bee project, but just another selling site. In the past, Purl Bee projects rarely required the purchase of a pattern (I recall the Liberty robe was an exception) or a kit. Is this to be the new approach for the revamped Purl Bee…I hope not. Thank you for getting in touch about this. We will always offer lots of free patterns and projects on the Purl Bee (in fact, the next two posts are both free pattens! ), but in recent years we have been offering some paid patterns and full kits like the one featured here. In order to continue to give our readers high quality, free patterns, we have found that we occasionally need to charge for some of our content. We hope you understand! We do hear you… Please rest assured that we are committed to the Purl Bee remaining an inclusive and inspiring place! Agreed with Sandra above…I have been checking the site daily to see if there would be new projects coming up after the make-over…and was disappointed to see this. It would indeed be super sad to see the purlbee being turned into an outlet for the shop…please don’t turn this into a commercial endeavour! Most of the patterns we publish on the Purl Bee are free but we do feature for purchase patterns and kits as well! Is this a pattern for hand sewing or machine? This pattern uses a machine. 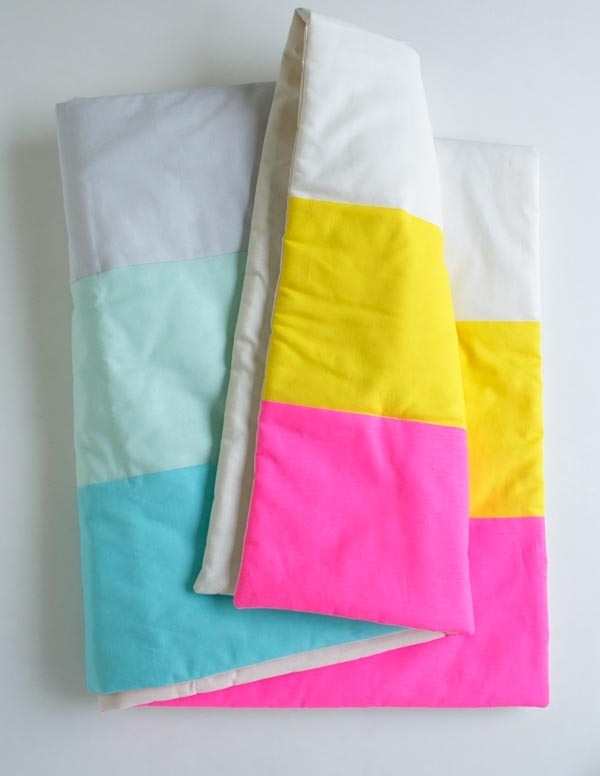 This blanket is adorable…I can’t wait to try it! How heavy is it? Does the pattern come with instructions for making it heavier if needed? I live in MN and would make a thick one for me, but my sister lives in TX and wouldn’t need that so much. Also, I’m very much a beginner so I don’t feel like I can take too many liberties with patterns yet! This is a great question. I am originally from Minnesota myself, so I know just how cold those winters can be! The wool batting that comes with the kit is warm and cozy, but also airy and lightweight so as to not be too hot. To make the blanket a little warmer, you could replace the cotton backing fabric with the Dorr Mill Wool Yardage as Molly used on her Liberty and Wool Lap Duvet project here. If you do chose this option, please take care to follow the prewashing instructions for the wool, but nothing in the construction of the blanket would change. And, If you think your sister would prefer something significantly lighter you could try the cotton Request weight batting, the thinnest batting we have available. Again, the construction of the blanket would be the same, but you would loose some of the wonderful loft the wool batting provides. This is a great question. 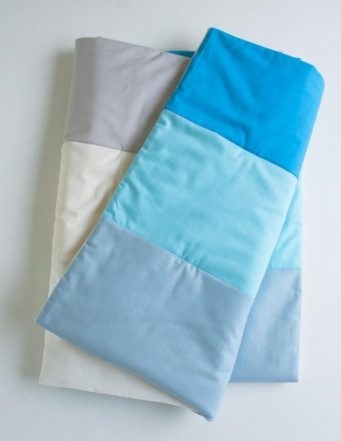 Most of the colors on the blanket tops are also Kona Cotton. The yellow in Sprout, the pink in Macaron and the orange in Orangesicle are Michael Miller’s Neon Solids. 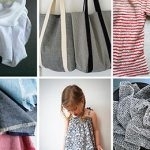 All of these fabrics are available by the yard at the Purl Soho shop. Corinne, I’ve been reading your site for about 6 months now and I’m totally engaged. The pictures are super, the projects are lively and other than the knitting, crochet and weave part of the site, I love it!! I just don’t K,C or W but you are filling my need for high quality sewing projects. I’ve been sewing way too long and sometimes finding something that stirs the soul is hard. 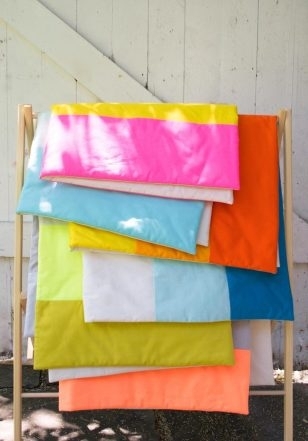 This kit for a beginner quilt is super colorful and easy. I’m not ordering it, not because I don’t like it, but because solid color prints are not my choice. Please keep providing us with beautiful projects to drool over, whether they are free or not. Great, great, great. And you are a commercial enterprise: do these people think your staff lives off of ‘l’amour et l’eau fraiche?’ Let’s assume you all love your work – but it is work nonetheless; you’re not volunteers. I can’t figure out something in the directions. At the end, when you do your final top stitching, it says to start 7 inches in, and then every 7 inches until you’re 7 inches from the end. If the blanket is 40″ wide, 40 is not divisible by 7. What am I figuring wrong?! Thanks. Thank you for writing in! You are absolutely right. This math does not add up. For accurate spacing of the tacking stitches, the first pin should be placed 5 inches from the left edge along the seam between Color A and B. Continue to place pins every 7 inches until you reach 5 inches from the other side of the blanket. We appreciate your careful reading of the pattern and thank you for bringing this to our attention. We will be updating the pattern pdf, all of the booklets we have in stock and the sewing errata page here on the blog. Please let us know if you have any other questions as you finish your blanket! This would have been a good one for a quilt as you go method and just had the batting be sewn in as you went….just a suggestion. Just received my box today. Simply lovely. Beautifully packaged and very easy to follow directions. Nice colors, a beautiful contemporary design that is indeed simple but so clean and elegant. A gift to myself but perfect to give others who love to sew beautiful useful things. Thank you. Just started my beautiful quilt blanket…… I’m not a quilter and have a little problem understanding the last step of tacking stitches across each seam. Regarding the long floats between the one inch long tacked seams……do these get trimmed away at the end, or are they part if the quilting design? Is the purpose of the tacking stitches so the layers don’t shift? Won’t the cream colored thread show on the colored side? Thank you sooo much for your beautiful patterns. I wish I could make almost ALL of them! Thank you for writing in. These are all great questions! The long floats do get trimmed in the very last step of the pattern. And yes, you are right, the purpose of the tacking stitches is so that all the layers of the blanket stay together. As for the color of the thread, because your tacking stitches are in the seam lines of the Top fabrics, as long as the stitch line is straight they are mostly concealed within the seams. That said, getting a perfectly straight tacking stitch can be challenging, especially for a beginner! I suggest working your tacking stitches on the lighter colored fabrics first as you practice the technique. By the time you work the darker fabrics, you should have a confident hand. I hope this all helps. Please let us know if you have any other questions as you finish your blanket! Just finished a sunny day blanket for my little guy and i LOVE it. So bright and cheery. Thanks for putting together such an awesome kit! Just wondering about washing/drying instructions for the finished quilt. What would you recommend? thanks! We are so happy to hear that you like your blanket! As long as you pre-washed and dried your fabric as instructed in the pattern the blanket will be totally machine washable and dryable. If you didn’t pre-wash and dry your fabric, don’t despair, it will probably still be fine to wash and dry, it might just pucker up a bit but that can be very pretty! As a precaution I might throw in a “color catcher” into the wash to prevent any bleeding. Thanks for getting in touch and let us know if you have any more questions! Rec’d kit and instructions call for a ‘walking foot’ I went online to purchase one and there are about 25 choices, i.e. inside or outside, and on and on. what type walking foot do I need for a singer machine. I am new to this, am a knitter not a sewer. Thanks for writing in! This is a great question! What you’re looking for is a “Even Feed” walking foot. If you are shopping online, the product page for the foot should list all its compatible machines, just be sure to check this list to see that your machine is listed before you make your purchase. Singer should have a model designed specifically for its machines. Any chance the pattern is available for purchase on its own yet? Fingers crossed! I purchased this in the colorway Orangsicle and in the instructions it refers to colors A, B, C etc yet they are not labeled within the box. Furthermore the reference photo on the box is very small and its hard to ascertain which of the whites are which. I’m sorry you’re having a hard time with this part of the pattern! The lettered colors work their way from the top of the blanket down, so the first stripe is Color A (Orange in the Orangsicle color way), the second color is Color B (the darker grey), etc. It’s true that the white fabrics are all very similar in tone, and can be hard to distinguish on their own, and particularly in a small photo! 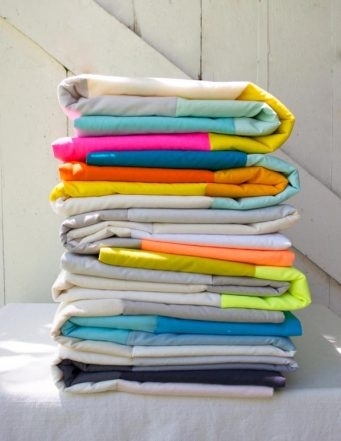 If it helps, they should transition from the creamiest (the white with the most yellow tint) to the brightest white. You may find it helpful to bring the fabrics to a spot in your house with lots of natural light. This should help make the slight variations in tone more visible. All this said, keep in mind that our color order can be used as suggestion only. 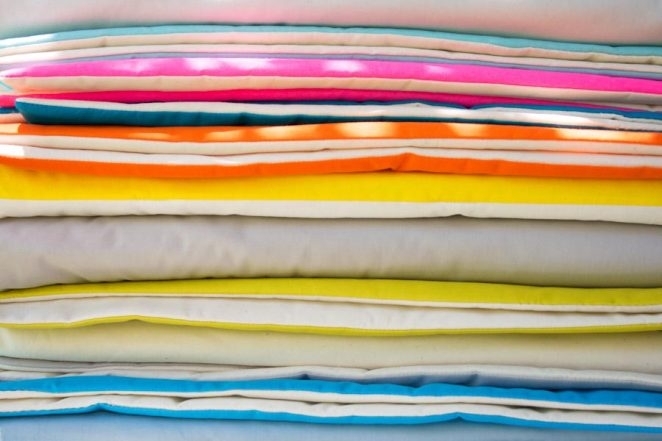 Feel free to put the fabrics in any order you like best! I hope this helps! Please let me know if you have any other questions as you work on this pattern. Just wondering if the batting should be prepared as well? And what the temp/cycle should be for the fabric/batting? Thanks. By prepared I mean prewash. Thank you so much for your question. The batting does not need to be prewashed. As for washing the fabric, I recommend washing it the same way that you plan on laundering the blanket. If you have further questions please let us know! Again, thank you for writing in! Hi, Can I please purchase this pattern on it’s own? I tried the link above in one of the other comments and it just takes me to the kit purchase. Thank you so much for writing in! 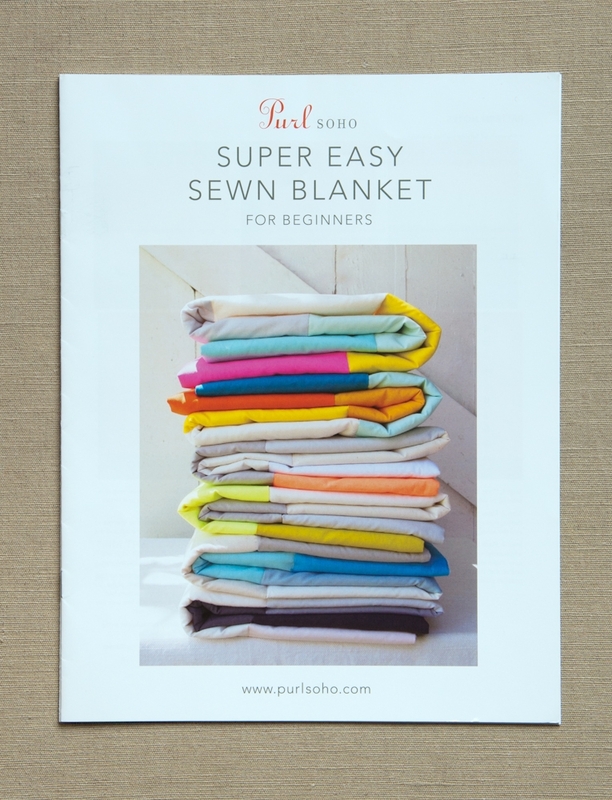 We do sell the pattern, you can find it here https://www.purlsoho.com/patterns/sewing/super-easy-sewn-blanket-for-beginners-pattern-1.html. If you have further questions please let us know! I really want to make these in a twin size and a full-size for my children. Do you you think it will be difficult for a casual sewer to adjust if I purchase the pattern? Then would you be able to put together the same materials as in the kit but in larger quantities needed? Is this too much to ask?! 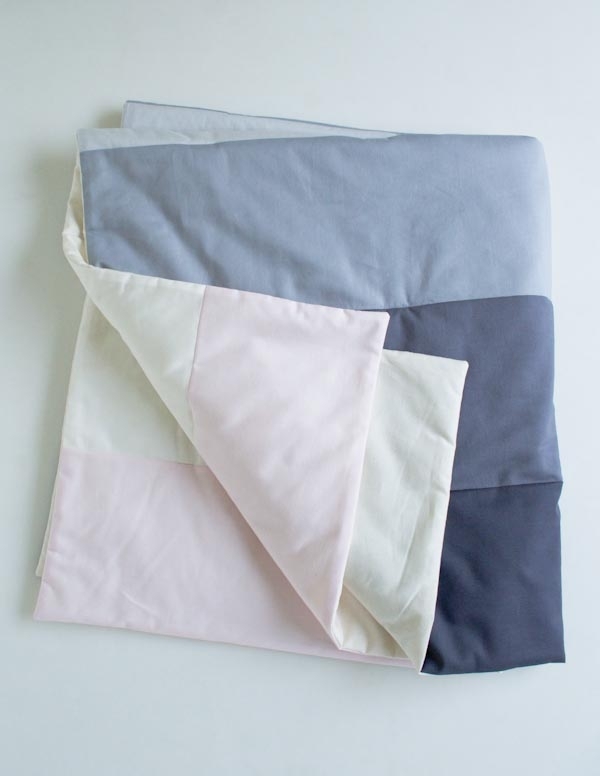 I just love the idea of sewn blankets for bedding – reminds me of the piles of blankets my grandma used at her house when I was little. Ahhhh, the weight of all those blankets on a cold night…. Thank you so much for writing in! 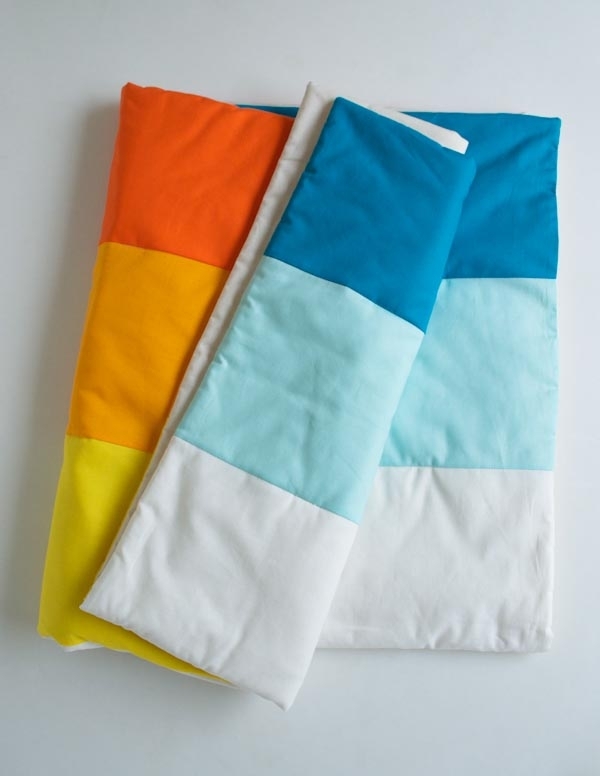 You can easily modify this pattern to make larger blankets! And we can totally put together “kits” for the larger sizes for you! Since twin and full sized blankets are wider than the crib size, you will have to seam two pieces of fabric together for each of the stripes and for the backing of the quilt. This is because the Kona fabric is only 44-inches wide whereas a twin-sized quilt would be about 62-inches wide and the full about 78-inches. Does that make sense? 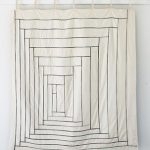 To make both the twin-sized quilt (62-inches x 87-inches) and the full-sized quilt (78-inches x 87-inches) you’ll need 1 yard for each stripe (so, 6 yards for the twin and 6 yards for the full, totaling in 12 yards). For the backing you’ll need 6 yards for each blanket. You can email us at Customerservice@purlsoho.com and let us know which colors you would like and we will gladly put together some kits for you. If you have further questions, please let us know! Thank you! If I staggered the seam for each stripe, it would probably look ok right? Do you happen to have a photo of the blanket as it is laid out flat? I need a visual! I think that a staggered seam would create some awesome visual interest to the blanket! We’ll email a picture of the blanket to you. Again, if you have any more questions while you’re working on this, please let us know! I know this is an old thread, but I’m making this into a twin blanket for my daughter’s bed. Can you send me a photo as well? Thanks so much! I made this as a lap blanket already and love it. Another question: I’m using the Macaron colors but silver is out of stock! My daughter requested purple, so I plan on substituting in a purple at the end (next to the blue probably?). Any recs for a Robert Kaufman purple that would look good with the other colors? And…last question: I want this to be really fluffy on her bed and am thinking about getting the highest loft cotton batting. Would that work? Thank you for writing in! The picture we sent to an earlier commenter was a photo of the 40 X 44-inch blanket, we will happily send you a photo! If you’d like to add a bit of mood to the blanket I recommend the Kona Cotton in Cerise or if you’d like to keep it light I recommend either Lupine or Petunia. What do you think? To make a really fluffy quilt I recommend getting the highest loft wool batting. Wool will stay much fluffier after washing than cotton. Please let us know if you have any more questions and again, thank you for writing in! 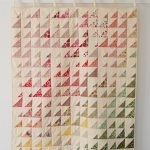 I have also ordered for fabric to make a full-size quilt like Melissa above. I’m an occasional sewer so I’m not really sure how to go about joining two pieces of fabric to increase the width – is there any tutorial for this? How do I stagger the seams for each strip when they are joined together in the end? Thank you for writing in! These are great questions! Joining two pieces of fabric width-wise is the same as length-wise. Pin the two pieces together and sew along the pinned edge with a 1/4-inch seam allowance. To get staggered seams you’ll sew your seam at different points for each stripe. For example, if your total width for the blanket is 78-inches, you could have a stripe whose seam is at 39-inches and another at 19 3/4-inches and another at 59 1/4-inches. Does that make sense? Let me know! Is there any reason why this could not be quilted all the way across rather than just at the tacking intervals the pattern suggests? Is it for aesthetic reasons? Thanks for writing in! You certainly can do a more complex quilting job here! We like the simplicity of the quilting method here as we think that it is an easily accessible way to make one’s first quilt while getting comfortable with some of the other techniques of quilting! 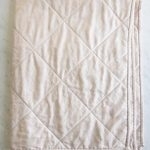 If you are already comfortable with these techniques and would like a different look, you can certainly change up the quilting technique. Can this be sized up to a king size quilt? How would the measurements change then? Thanks for writing in! You can certainly size this quilt up! A standard King size quilt is 110 x 108 inches. With those measurements, the finished height of each stripe will be 18 inches. To include the seam allowance, you will need stripes of each color that are 110 1/2 inches by 18 1/2 inches. This will require piecing the stripes together with roughly 3 pieces to get the length given a standard bolt height of roughly 40 inches. You will need about 2 3/4 yard of each color stripe. You will also need to piece the back together. If using the Kona that we suggest here, you will need between 8 3/4 yards and 9 yards. I have made 3 of these, and love them all. Can you help convert the pattern to a TWIN size? I’d happily buy the fabric and batting through you guys! Thanks for reaching out! 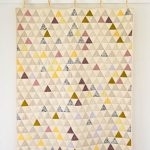 Although it takes a bit more sewing, you can certainly convert this to a twin size quilt! For a quilt measuring approximately 66 inches by 87 inches, you will need 3/4 of a yard of each of your 6 colors, wool batting in a Twin size, and a backing fabric – I would recommend using 2 yards of Moda Muslin in the 90 inch width so you do not have to piece your backing. After following the instructions in the pattern to square up your fabric, you will cut two 12 inch wide strips from each color and seam them together on the short side to make six 12 inch by 87 inch strips. You can then follow the rest of the instructions for piecing the top and creating your quilt sandwich; however, our wool batting comes with a recommendation to quilt no more than 8 inches apart, so you may wish to do an extra row of stitching down the center of each color strip in addition to the quilting instructions in the pattern. I hope that helps! Please let us know how your quilt turns out!